Home / Basic aerodynamic forces / Drag / How do airplanes fly / lift / Thrust / Weight / How do airplanes fly? Airplanes have made human life faster. We know that when a small stone is thrown up it will come back to the earth due to its gravitational force. On the other hand an airplane, with hundreds of passengers, flies thousands of kilometers. So how do airplanes fly? We will unveil this mystery today. So basically, there are four forces acting on the airplane which makes them fly and keeps it in the air. The weight of an airplane is due to the gravitational pull of the earth. The direction of this force is towards the center of the earth. The magnitude of this force equals to 'mg'. Where 'm' is the mass of an airplane & 'g' is acceleration due to gravity. The point at which this force acts is known as the centre of gravity of the aircraft. The location of the center of gravity of the aircraft is very important. Stability of the aircraft depends on the location of its center of gravity. Center of gravity of the aircraft is positioned in such a way that if any, external disturbance, such as wind, disturbs flight of the aircraft, it should return to its original position on its own. The Airbus A380 is world's biggest passenger aircraft. The maximum takeoff weight of the Airbus A380 is 560,000kg (1,234,600lb). The lift force on an aircraft is equal to the weight force of an aircraft while in cruise. The lift force acts normal to the direction of oncoming airflow towards the airplane. This force keeps the aircraft in the air. An aircraft gets lift from its wings. Lift to the aircraft wings is produced due to their aerofoil shape (cross section shape of the wing). Lift is produced due to the presence of the pressure difference above and below the wing. There are two main explanations for the production of lift. One is Bernoulli's principle and other is Newton's third law. Click here for more details on the lift. Thrust is a force which pushes an aircraft forward. 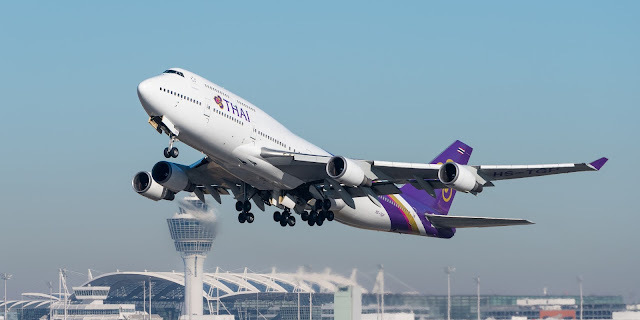 Thrust is provided to the aircraft with the help of engines. There are various types of engines used. In early aircraft, piston engine was used. Various arrangements of piston engine such as V-shaped, linear & circular arrangements were used for various purposes. Nowadays turboprop engine, turbojet engine, turbofan engines are used. The afterburner is used to increase the thrust of the aircraft for some time. For supersonic aircraft Ramjet & Scramjet engines are used. Conservation of momentum is the principle for working of engines. 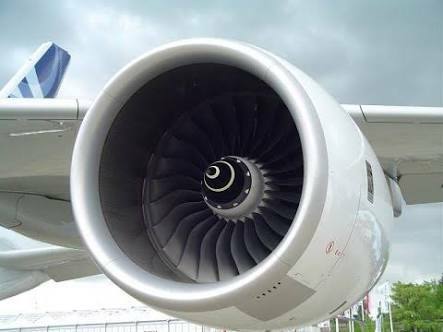 In an aircraft engine, Enthalpy (heat energy) of air is increased by increasing its pressure by compressing it in the compressor and increasing its temperature in the Combustion Chamber. Then this energy is converted into kinetic energy. Which results in a change in momentum and production of thrust. The drag force is a restrictive force to the motion of the aircraft. The drag force is equal and opposite in magnitude to the thrust force in a steady condition (cruise) of the aircraft (When an aircraft travels at constant speed). There are various types of drag. Mainly Parasite drag, Lift induced drag, Wave drag, Skin friction drag, Form drag, Interference drag. To know more about drag check out this article.